Record Rainfall in Northern and Central California. Los Angeles Ends Water Year at 133% of Normal Rainfall. Hot Weather Forecast For July 4th Weekend. Tuesday a front associated with an unseasonably strong Pacific low pressure system broke rainfall records in much of the northern half of the state. Precipitation records for the date were broken in numerous locations, including Monterey, San Jose, Oakland, San Francisco, Napa, Sacramento, Redding, Eureka and Crescent City. Here are archived copies of record reports from the San Francisco Bay/Monterey NWS Office and the Sacramento NWS Office. The front and trough produced a few clouds and cooled temperatures in the Los Angeles area, but I didn't see any reports of rain. Downtown Los Angeles (USC) will end the July 1, 2010 to June 30, 2011 water year with 20.20 inches of rain. This is about 133% of the climate normal of 15.14 inches. According to NWS data Camarillo/Oxnard recorded 139% of normal rainfall, Long Beach 145%, Santa Barbara 169% and Palmdale 105%. Looks like temperatures will be warming up for the July 4th weekend. Temperatures are expected to reach into the 80s at the coast, 90's inland and 100's in the valleys. Desert areas could reach 110 or higher. Models suggest the possibility of some monsoon moisture moving into the area Sunday or Monday, along with a chance of thunderstorms in the mountains and deserts. Check the NWS Los Angeles/Oxnard Office for the latest forecasts and warnings. Monsoon Pattern Results in Flash Floods & Debris Flows. Monsoonal flow that began last Thursday has resulted in numerous thunderstorms in the mountains and deserts of Southern California, with flash flooding and debris flows reported in several locations. Areas in or near recently burned terrain are particularly susceptible, and flash floods and debris flows appear to have originated in the 2007 Oak Fire burn area in the eastern Sierra, and the still burning Piute Fire burn area near Lake Isabella. 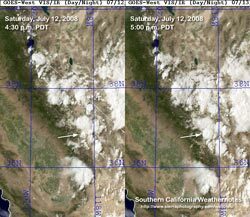 This sequence of three GOES-WEST VIS/IR satellite images from NRL's NEXSAT web site shows the explosive development of a convective cell north of Mt. Whitney on Saturday afternoon. This appears to be the thunderstorm that produced the heavy rain in the area burned by the Oak Fire, and resulted in the Oak Creek debris flow near Independence. Here's an AVI loop, generated on the NEXSAT web site, for the period 3:00 p.m to 6:00 p.m. PDT on Saturday. 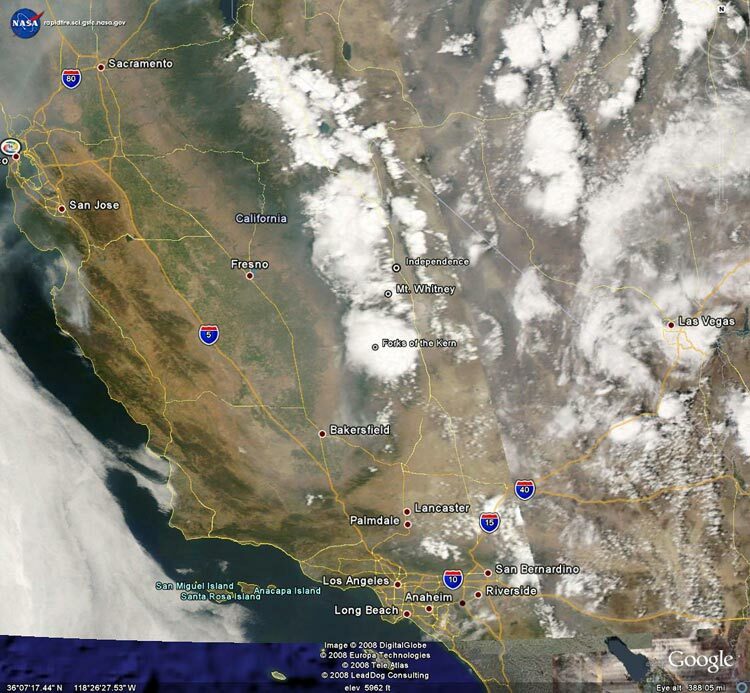 A particularly large thunderstorm cell/complex developed in the Sierra Nevada south of Mt. 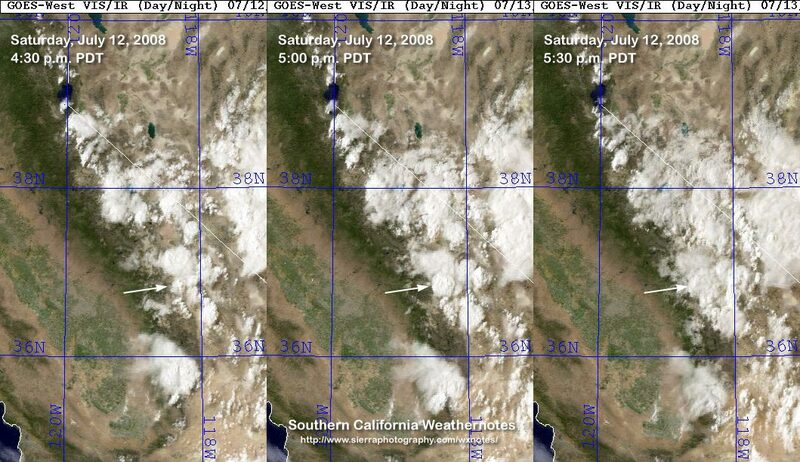 Whitney midday Saturday and drifted south down the Kern River drainage over the course of the afternoon. At about 2:45 p.m. the cell/complex was centered near the confluence of the Little Kern River and N.F. Kern River and measured about 44 miles in diameter. Here's a Google Earth image of the cell/complex with a 250m resolution True Color Aqua cloud layer imported from the MODIS Rapid Response System. This GOES-East/West Precipitable Water composite from 9:00 this morning indicates precipitable water values as high as 1.6" in some areas of Southern California, and the possibility of more mountain and desert thunderstorms continues today. Update July 25, 2008. The large cell/complex that developed south of Mt. Whitney on Saturday, July 12, and drifted south down the Kern River drainage appears to have produced the flash flooding and debris flows on Erskine Creek and other creeks in the Lake Isabella area late Saturday afternoon. This cell/complex can also be seen in sequence of three GOES-WEST VIS/IR satellite images and the AVI loop previously referenced.